The Apple TV has had an interesting history. Starting out, it accompanied the iPhone as Apple’s “next big thing,” even if its spotlight was dim in comparison with the iPhone’s. From then on, it became a “hobby,” and now I wonder if it’s even that. Deeper in the store, the Apple TV gets a mention, but under Mac Accessories. So is the Apple TV for iPods or for Macs? What gives? If Filemaker Pro and Apple’s printer bundle can get a graphical mention on the Store homepage, why not Apple TV? The “Misc.” section is a mish-mash. Displays, peripherals, networking and backup products – and the Apple TV. One could argue that it belong with the iPod, but I consider iPods portable music devices. And the Apple TV isn’t quite a Mac, either, even though it runs a version of Front Row and connects with an iTunes library. No, it’s just kind of out there on it’s own. It has no rock-solid home in the current Apple lineup. For “Entertainment,” we have to imagine the Apple TV as its own category – perhaps a harbinger to things to come. Of what? There have been rumors of some sort of Apple television. Maybe they’ve been waiting for competition. Maybe they’re striking a deal with Netflix and Boxee right now. Maybe there’s a flatscreen TV out there with an Apple logo on the back, waiting to be released. It’s just speculation, and I don’t consider it a worthwhile rumor for the time being. Apple, now, seems focused on its Touch devices – specifically the iPad. The Apple TV is surely stuck in some development limbo. One could even argue that the fourth-leg of the Apple stool is now the iPad instead of the Apple TV. 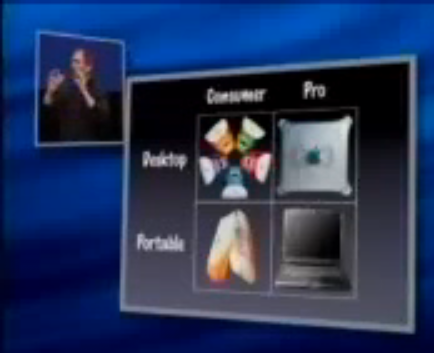 Back then, you had two consumer Macs and two pro Macs. In the G4 era, things became a little less simplified with the PowerMac G4 Cube (unless you want to lump it with the regular PowerMacs) and the iPod. 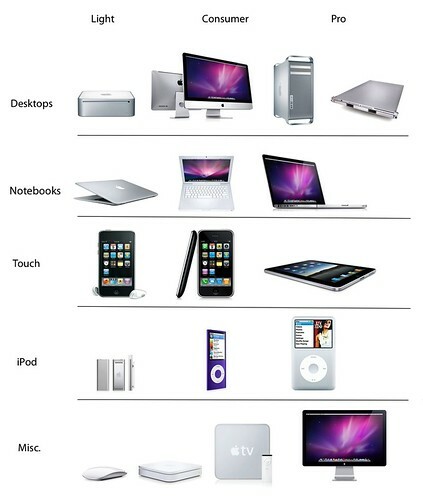 But even then, you could fit products in definite categories: consumer Macs, pro Macs, smaller iPods, and full-sized iPods. Posted by davelawrence8 at 7:23 am on March 19th, 2010. 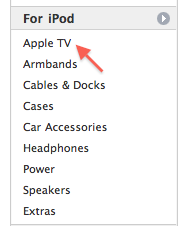 3 comments... » Categories: appletv. 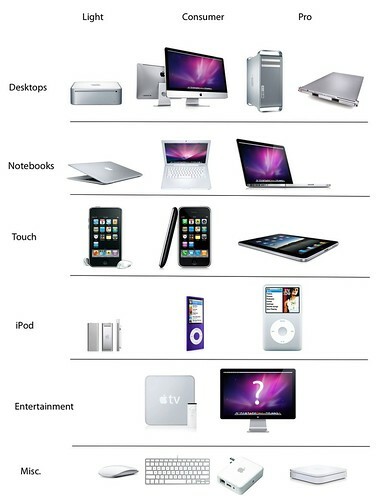 Tags: apple TV, apple.com, G3, ipad, iphone, ipod, macs, store, touch. Subscribe via RSS. The Apple TV has never been about the device itself, it’s about the content and the delivery mechanisms, think of it as a testing ground for the iPad and all the audio/video content that will be coming down the pipe. Because of the Apple TV Apple has already been able to secure agreements with many content providers, and now there will be even more. How about syncing your iPad to your Apple TV- the Apple TV as a back-up for your iPad (if you don’t have a Mac)? Posted by John R on March 20th, 2010. 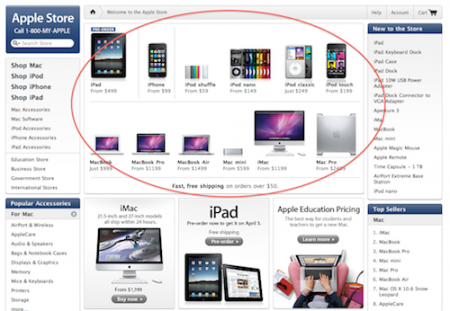 Posted by Newton Poetry — Disappeared: Apple’s Mac Download page on May 10th, 2010. I hope that Apple continue to invest in the development of Apple TV in the future, mainly for the reason that it makes for a great media server for more than just your television. Apple TV has a few useful features that no other iPod has, and yet is small and cheap enough to have without getting a fully blown Mac (or PC) to otherwise have in place of it. The biggest, most useful feature apart from watching movie rentals with it is as an AirTunes server for your network. I have a network of AirPort Express base stations connected to speakers at two places in my home, and the Apple TV acts as a music centre that is controlled by my iPhone. With these three components, I have a way to deliver music to any place in my house, without tying up a dedicated computer for the job, without tying up an iTunes “Authorised Computer” privilege for the purpose, and without having the TV switched on to control Apple TV! You can do that with a personal computer running iTunes, but this requires some setting up that Apple don’t do for you—you need to explicitly set up system preferences on a Mac or PC (running Windows) to automatically log into an account and start iTunes when your computer starts… and pay at least double what an Apple TV would cost in order to do this. Apple TV can do all this more cheaply, with less administration preparation, and without risking your iTunes library from potential human accidents (because it can keep its own copy of the stuff you want to play, and syncing is a human-independent process). And because it connects to a TV set, you can watch your movies and your podcasts with it, again, without tying up a dedicated computer for the job! One thing that people also seem to forget is that because media you can play back comes from the iTunes Store, that same media could also be played back on your Mac or PC, iPhone or iPod. You can’t do that easily (or legally) with movies from other sources, because this involves making a copy of disc whose content is most probably protected by copyright laws. With the iTunes infrastructure, Apple has made it allowable for you to purchase or rent material that can legally be played back from many kinds of devices. I really like the Apple TV, both as a concept and as a product. However, in Australia, I feel that it’s the iTunes Store that is holding the product back (as well as expensive/slow Internet connections!). If there was more content available for rent (like foreign films, etc. ), then I’m sure that the Apple TV would be even more attractive a gadget to have as a part of your entertainment system. Posted by Tony Kavadias on May 28th, 2010.